Office design is changing for the better with companies like Seattle’s ATLAS Workbase leading the way. The way we look at office design is changing. Traditional concepts of the “office” are becoming less relevant as more professionals seek a workplace that fosters creativity and satisfaction. Companies must now provide workers with the ways they need and want to work to appeal to their greater sense of purpose. Ultimately, a purpose-driven culture is a winning culture, and an integral part of a winning culture is tapping into the employees’ need to feel purpose and engagement within their company. Rivethead, published in 1992, tapped into this phenomenon early on. Nobody wants to feel like a number, obediently spinning the wheel. Build a great culture, foster the encouragement of self, and together this becomes its own galvanizing force that ultimately drives higher levels of engagement. A few questions employers and businesses should be asking: What if we could increase the percentage of employees who feel engaged, what kind of effect would that have on our bottom line? On talent retention? On happier customers? Every business, large or small, wants engaged employees who report high satisfaction with their workplace. For designers, this is the Holy Grail, because there is a lot of work that still needs to be done. According to a 2015 Gallup Poll, disengaged employees currently make up one-third of the average workforce. This shift is about creating micro-environments within the workspace that not only help people thrive as their tasks and priorities change throughout the day, but also focuses on their well-being. This tsunami of change has also been driven by technology, which combined, has catapulted us into what some are calling a “Workplace Renaissance”. And these inspired environments are not just limited to modern co-working spaces, but also new condominium common areas, progressive real estate offices and just about every thoughtful business operation that seeks to be competitive into the next decade and beyond. For most aspects of our work-play life, design of these spaces is changing. What do workers want out of their workplace? Adjustability. They want privacy when they need it for focused work, but also collaboration areas when working with teams. 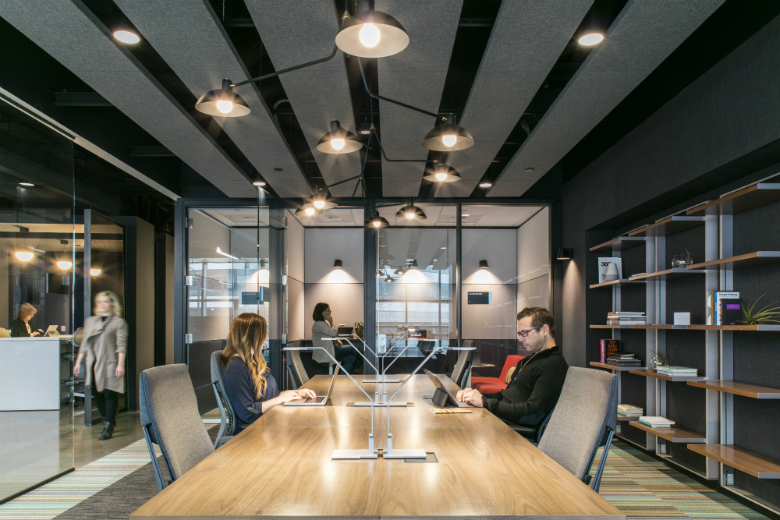 Spaces that give them the ability to segment their day with choices based on the task at hand. For example, after completing their core work, is there a comfy couch that puts the employee in a creative mood, but is also a spot to seek rejuvenation when required? Technology now drives the workplace, making us untethered through the freedom it provides, yet tethered through the connectivity it delivers. The way we collaborate and the immediacy of reaction/response from coworkers has changed dramatically in just a few short years, altering our concept of workflow and the way we share and disseminate information and ideas. When designing for creativity, spaces must be infused for both focused attention and diffused attention. Diffused attention, also known as daydreaming, is the spark that ignites creative thinking. Today, we know it’s critical to create spaces that tap into this for at least part of the day. Comfort. Employees want to be at work without feeling like they are at work, a concept which can be created through enjoyable spaces that drive and foster serendipitous interaction. Perhaps you remember the workspace of the 70s or 80s, consisting of an uncomfortable chair, bad lighting and a daily desire to take a 3 p.m. nap. All this, while your boss sat in his private office, sequestered from the rest of the staff. Oh, to be let into the inner sanctum! Today we realize, for the most part, that those walls and inner sanctum were not bridges to success, but impediments. In those mid to late-century offices, the word “ergonomics” was a distant dream. That won’t fly today. Designers now aim to create spaces that combine residential scale and aesthetics with the workplace, where functionality and efficiency meet the comforts of home. This means that when creating modern workspaces, designers look at everything down to the type of sofa they’ll put into that big new collaboration area, plus other things that remove the traditional polished office look, which does not rank high on the list of needs for millennial workers. Culture. In addition to engagement, the C-suite now recognizes that workplace culture is the catalyst to increased collaboration and innovation. This is why companies like Yahoo! reigned in telecommuting; it’s why Weyerhaeuser built its new corporate headquarters in downtown Seattle; to infuse their culture and bring it to where its talent pool lies. Innovation and creativity are driven by collaboration and teamwork, the life engine of any successful company. Culture driven by design takes its cues from many different things, such as the way natural materials are woven into spaces. Physical surroundings can shape people’s behaviors and attitudes about their overall experience at work. Culture building can also come from an infusion of settings and materials that connect us with nature, and thus, it’s no surprise that natural elements drive the kind of emotional, cognitive and physical well-being we seek at work. This can simply be done with obvious touches such as plants, lighting, woods, fabrics and other natural elements. Exemplary innovation can be found in the Kirkland, Madison Park, and Bainbridge Island offices of Realogics Sotheby’s International Realty, where unique design combine retail space with office space, cultivating community engagement specifically designed for its neighborhood. In Kirkland, owner Dean Jones helped to conceptualize a retail space and wine bar at the front of the office, resulting in a dynamic office and event space, partnering with DeLille Cellars. The environment boasts flexible chambers of space defined by movable wall partitions that create the retail space, entry atrium, central gathering room, and conference center, as well as the brokerage Great Room, overlooking the Kirkland Marina and Lake Washington. As demonstrated by the numerous events held there, RSIR brokers utilize the dynamic space, opening from street to bay, to work and play. Kirkland office of Realogics Sotheby’s International Realty; Image Credit: Realogics, Inc. Given the warm reception of the combined spaces, Jones carried the concept to other RSIR office locations, such as Madison Park and Bainbridge Island. In 2016, RSIR opened a new Bainbridge Island branch, occupying approximately one-half of the Old Hardware Store. RSIR collaborated with the adjoining restaurant and bar Bruciato, operated by famed chef and Bainbridge Island resident Brendan McGill of Hitchcock. Again, Jones and his team implemented a successful formula of supporting local businesses by combining their space with branch offices, in a blend of culture, cuisine, and real estate. Bainbridge Island office of Realogics Sotheby’s International Realty; Image Credit: Realogics, Inc. There are many things that go into designing the perfect workspace where creativity and engagement is fostered, well-being is paramount, and providing workers with satisfaction and a sense of self is encouraged and nurtured. This is what we had in mind when we designed ATLAS Workbase. Segmenting your day is not all there is to it. There is also an alchemy to work. You enjoy being there, you enjoy how you feel and the vibe surrounding you is uplifting. It’s the little things that augment how employees gauge their physical and emotional comfort while at work. Things like ergonomic seating, closeness to coworkers and other design elements can support these feelings and convey that they are not a number. Providing equal access to spaces, tools and technology encourages engagement. Different spaces for different needs is the key to buttressing both individuals and teams as they work their way through the creative process. Spaces should support each facet from idea generation to iteration to product/service. Think: Open spaces, quiet spaces, fun spaces, safe zones, lounge areas, private spaces, meeting places and...no cubicles! Is Common Space-Design Limited to Workspace? As Seattle sees building after building coming to market, residents are sitting front row in the amenities arms race. Dog-washing facilities, kitchens equipped for cooking classes, wood-working rooms, gaming stations and brewery rooms are flooding the market. The Burrard Group has found a sophisticated way of serving their residents through the thoughtful design of its lobby, Podium Club, and Sky Club at NEXUS, a 391-unit condominium building in the East Village. NEXUS offers two amenity levels, encouraging residents to mingle and create a community within the building. Each level is unique in its design, featuring space such as a media room, think tank, work lounge, yoga studio, veranda, fireside lounge and conference room. “NEXUS is a vertically-integrated neighborhood that is setting the bar for a life well-lived in the city,” said Dean Jones, President & CEO of Realogics Sotheby’s International Realty. Jones, with RSIR managing the pre-sales of the NEXUS building, references this innovative design as an impetus in setting the bar for future developments, as well as setting this product apart from its predecessors, which could be cited as part of the success in 84% of the units already pre-sold. As we see office space moving towards a more collaborative design, will we continue to see multi-family buildings follow suit? Workspace design, as well as condominium demand and design, are just a few of the endless topics discussed by the FutureCast Forum. The FutureCast Forum is a collaborative of independent opinion leaders who explore current and projected market fundamentals that are materially influencing the Seattle/Bellevue metro area. Founding members and guest columnist provide timely insights on the state of the economy; commercial, residential, and retail development; evolving demographics; wealth management considerations; government policies; lifestyle trends and international interests that are reshaping our skyline into a global city on the rise. For more information, visit Seattlein2020.com. Bill Sechter brings decades of industry experience to fuel his role overseeing the strategic vision and operations for ATLAS Workbase. His focus is providing superior and relevant services to members and guests while disrupting the coworking industry by expanding to new markets with global strategic partners. Sechter is a thought-leader on the future of shared working space and the evolution of “Third Place” environments. Additionally, Sechter has been a leader in international sales, business development, operations and entrepreneurialism over his 35-year career of working for himself, start-ups and leading Fortune 1000 companies. Graduating with honors in 2012 from the Seattle University Executive Leadership MBA, Bill traveled the world over the last three years exploring the coworking and “Third Place” marketplaces looking for “Blue Ocean” opportunities as he developed his business plan for ATLAS Workbase, which opened its first facility in Seattle in 2017.